A little dog with a big heart and even bigger personality, the Maltese has been known by many names, says the American Kennel Club. Called “Ye Ancient Dogge of Malta” and the “Roman Ladies Dog,” this breed stands out with its fluffy, white coat and springy personality. Growing to no more than about 7 pounds and living as long as 15 years, Maltese make exceptional pets for those willing to give them the time and attention they require. These high-energy dogs have roots tracing back to ancient times, with the earliest known recognition of the Maltese’s value found as far back as Grecian, Roman and even ancient Egyptian eras. In ancient Greece, lavish tombs were even erected for these beautiful and bubbly little pups. Throughout history, the Maltese has maintained their regard as prized pets, despite the exact origin of the breed remaining unknown. Whether or not we know where the Maltese originated, many believe that the breed comes from the Isle of Malta in the Mediterranean Sea from a Spitz or spaniel-type dog. During the 15th century, French aristocracy embraced this plush pooch, while the British also received Maltese dogs with open arms. Within a hundred years, the breed was known as the ideal pet for ladies and royals. Numerous royal figures, including Queen Elizabeth I, Mary Queen of Scots and Queen Victoria were known to own and love Maltese dogs during their reigns. The Maltese’s popularity was nearly lost during the Dark Ages following the fall and decline of the Roman Empire. Attempts to create a smaller Maltese failed, and the many varieties of mixed breed pups eventually led to the formation of several other breeds, like the Bichon Frise, Bolognese and Havanese. Making a comeback in the late 1800s, the Maltese is now back on top, known worldwide as a beloved best friend and beautiful companion. 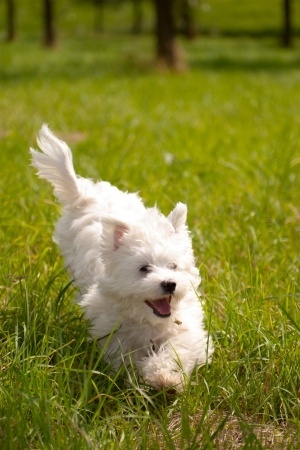 Maltese puppies are among the many small dog breeds that we offer at Pauley’s Pups. Let us help you find the perfect puppy to join you family. Contact us today for more information on our pups for sale or take a look at our current puppies online.